Our Design engineers can create an installation that is the most efficient to do the job and the most efficient for your budget, no matter how big or small this may be. We have engineers that have experience in abundance in the electrical industry and one of their fields of expertise is design, it is important that the engineers on site know exactly what they are doing but that all stems from a well organised specification sheet and set of plans. Our design engineers can produce documents that incorporate cable calculations taking into account length and cross sectional area of cables with different conductor material, to control gear used to operate the most complicated machines and even design installations in hazardous areas. The process on how this happens is by a site visit or meeting with the client to grasp what is required, then a lot of hard work and dedication goes into ensuring the correct equipment is used depending on the job itself. Projects that we have been involved in include; an extension on a food factory, 90 new build homes, designing the electrical needs for the different types of dwellings, a feed line on a farm to feed livestock to a hazardous area design on a chemical plant. 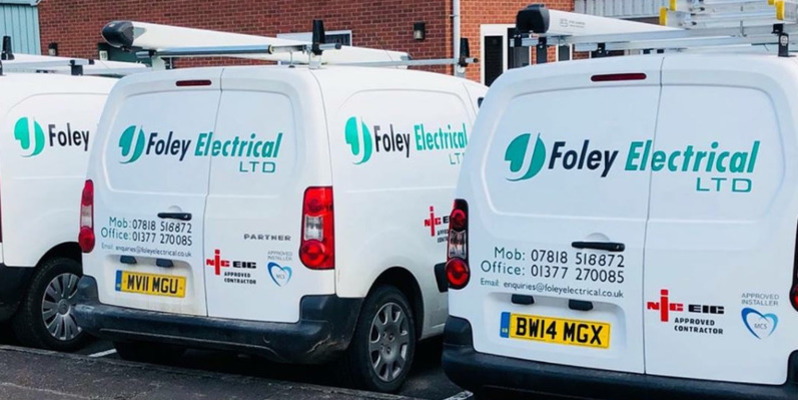 At Foley Electrical we take pride in looking after the customers needs from the initial meeting through the design on to the installation and then to the test and commissioning at the end. Our engineers are experts in their field of the installation, we work together as a team to make the job run smoothly.